I have not developed an aversion to tomatoes; on the contrary, I’m a big fan of their versatility and their fresh way of signaling the heart of the summer season. But 2018 marked a departure in my perspective on tomatoes: I enjoyed my tomatoes a hell of a lot more this year than I did in years past because I didn’t spend half of August and September longing for my favorite CSA crop, sweet potatoes. (If you’re curious about what makes second place, it’d be a tie between beets and butternut squash, both of which show up around the same time.) I’m certainly glad they’ve finally arrived, and hope very much to post a recipe for sweet potato gnocchi with sage and brown butter soon, but I didn’t let any tomatoes go to waste in the back of the fridge this year while dreaming up autumnal dinners. 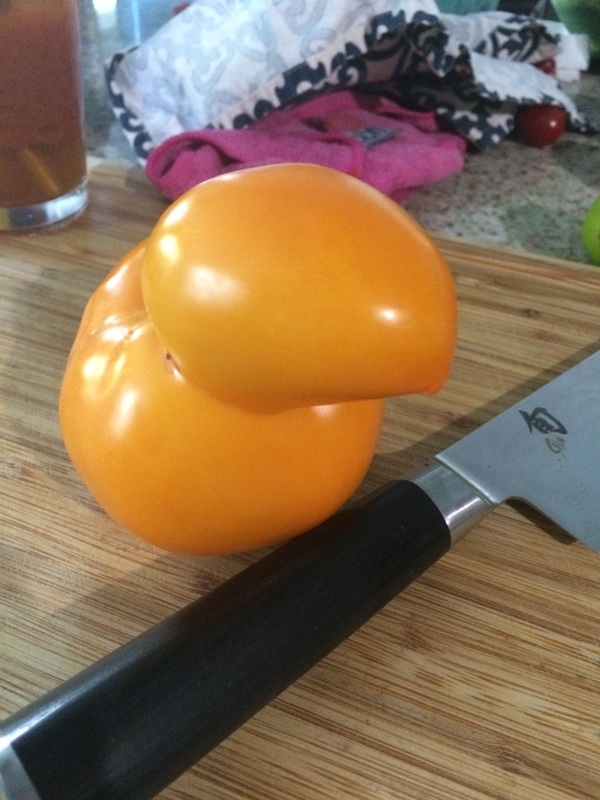 I’m a huge fan of local produce–you never get cool duck-shaped tomatoes in the grocery store. Most of my tomatoes ended up roasted this year. The flavor is so rich and delicious, and they’re great with just about everything. To roast tomatoes you have to scoop out the insides. 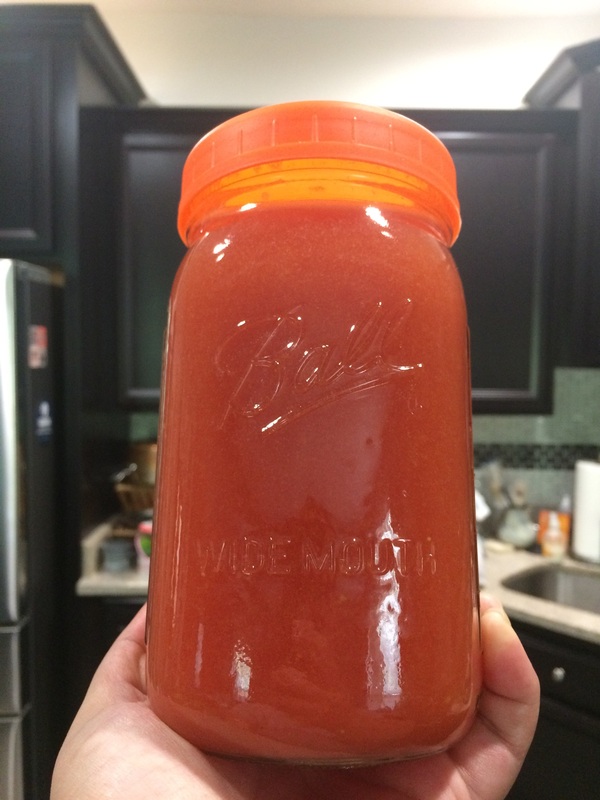 I pressed and strained all the tomato scraps to make tomato juice. 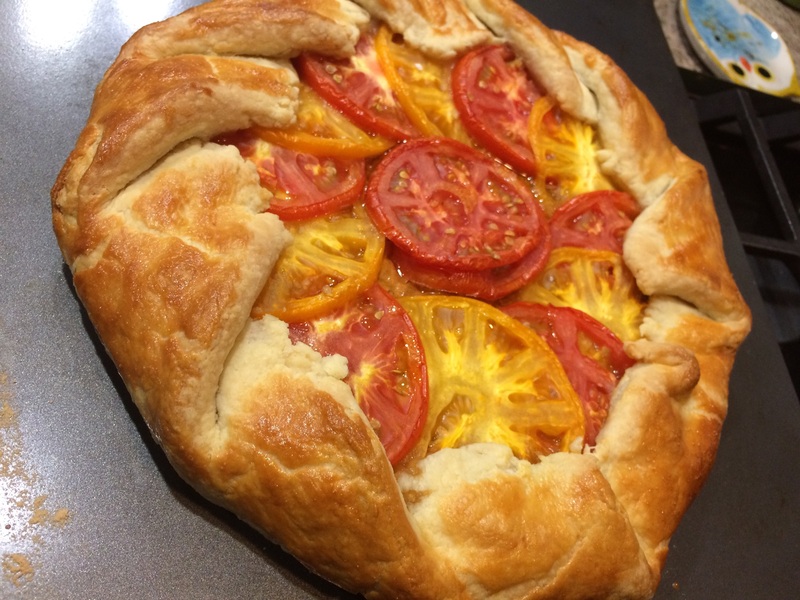 Tomato crostata: an excellent use of both fresh and roasted tomatoes (those are on the bottom), and a bit more fun to make than a regular pie. I can’t begin to imagine how many pounds of tomatoes I left to languish in the back of the fridge in the last decade, my enthusiasm for them dulled by the anticipation of sweet potatoes, squashes, and beets to come. It’s too sad to think of the salsas, bruschetta, pasta sauce, and tarts that went unmade and uneaten. During the time I was trying to keep this blog alive, and for a little while before then, I built this terrible habit of looking forward to things that were coming up in the relatively near future. I don’t mean to say that I got myself into a bad habit of optimism, but I started anticipating and planning positive developments like–to give an example relevant to this time of year–the coming of sweater weather or the chance to go apple picking. These are two very lovely parts of autumn, but if you spend your time wistfully looking forward to the things you may later experience or–sigh–be able to blog/Instagram/tweet/post about, it doesn’t leave as much energy to enjoy the present. To put it in terms relevant to this blog’s title: it’s hard to enjoy the good life now if you’re worried about how you’re going to enjoy the good life later. I hope I don’t come across as too much on a soapbox about my vegetable beliefs, but if tomatoes are still in season where you live, I highly recommend making the most of them while they’re still around. While my tomato crostata wasn’t exactly like it, the recipe from Pancakes & Biscotti served as my inspiration (you can check it out here). 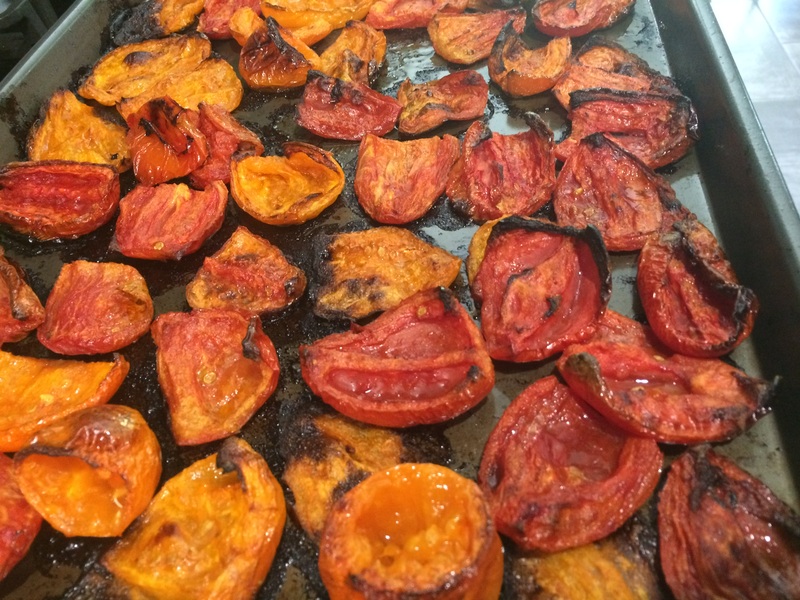 If a rich tomato flavor is what you want, roast your tomatoes first like I did, following these instructions from Ina Garten. And if you do that, be sure to strain the scooped out tomato leftovers for a bright and fresh tomato juice–using it for an Old Bay Bloody Mary is highly recommended. If tomatoes are already out of season for you, stay tuned. If I can find the time between work, baby, and the occasional sleep, I’ll be back with a recipe for sweet potato gnocchi.